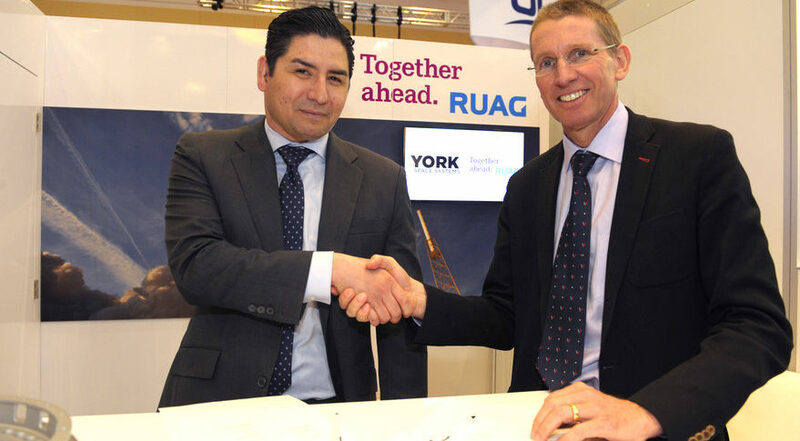 Dirk Wallinger, York Space Systems chief executive, and Peter Guggenbach, RUAG Space chief executive, signed an agreement April 17 on RUAG payload adapters for York satellites. COLORADO SPRINGS — York Space Systems, a Denver-based satellite manufacturer, announced plans April 18 to work with Swiss satellite and rocket component supplier Ruag Space on payload adapters for its satellites. Ruag plans to supply the new payload adapter for York’s Harbinger Mission scheduled to launch later this year. Harbinger is designed to demonstrate York’s S-Class platform, a three-axis stabilized spacecraft for payloads of 85 kilograms or less. The new payload adapter will enable satellite operators to quickly mate spacecraft with launch vehicles, Engström said.